So with actual snow lacking, in order to get our snow fix the grandchildren and I have read some snowman books, including one of my personal favorites, “The Most Perfect Snowman”. 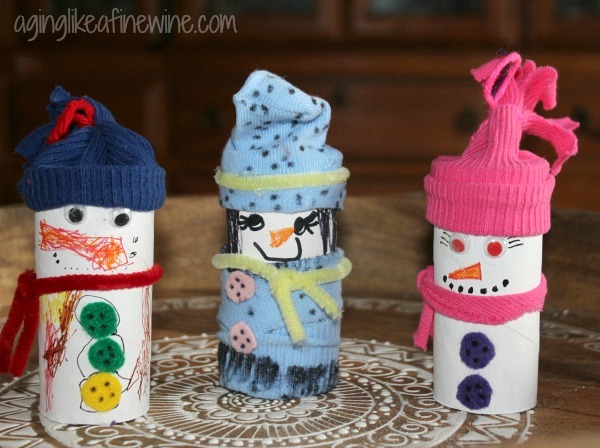 Then we moved on to snowman crafts. Our first craft was these cute little guys made from empty toilet paper rolls. something to protect the clothes the grandkids will be wearing!! First, paint the toilet paper roll white and allow it to dry. We found that the paint didn’t appear to be covering the toilet paper roll very well, but once it dried it was fine. Cut off the top of the sock and place it on the top of the dry toilet paper roll. You can roll the edge of the sock here to give it the look of a beanie. Tie the top of the sock with the yarn and then cut the sock in strips, almost reaching the yarn. Cut a strip of fabric from the remains of the sock and tie it around the tube as a scarf or use pipe cleaners. After all that work, it was definitely snack time. So we moved on to making a snowman to devour! 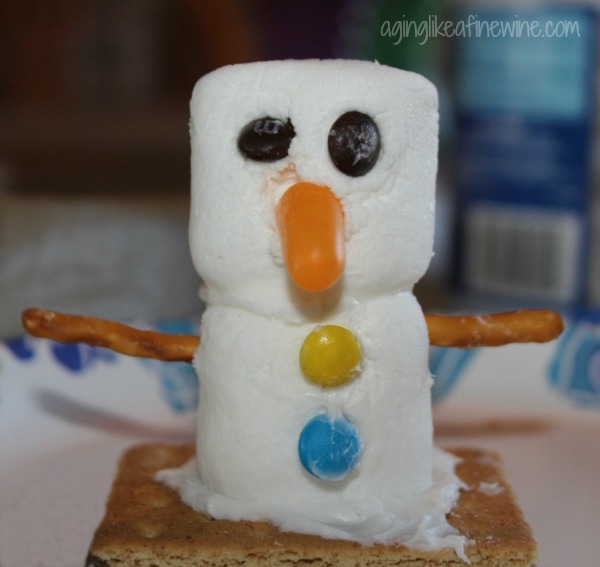 On the grandkids next visit, we worked on one more snowman craft. This one wasn’t really structured. I did show them my idea for their snowman, but they used their imagination to create their own vision. 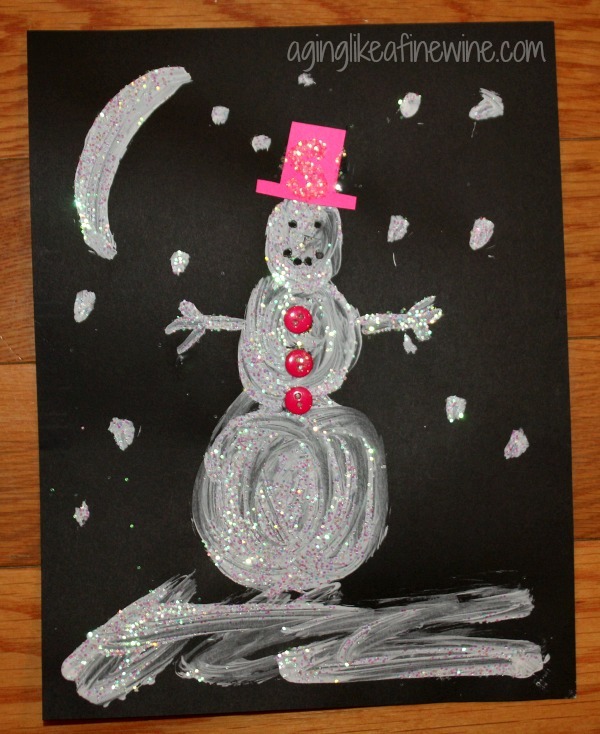 For younger ones, draw the outline of the snowman for them and let them paint it white. The older ones will happily create their own shape. Sprinkle glitter on the white paint while still wet. Allow the paint to dry some and shake off the excess glitter. Use the black marker to draw the eyes and mouth. 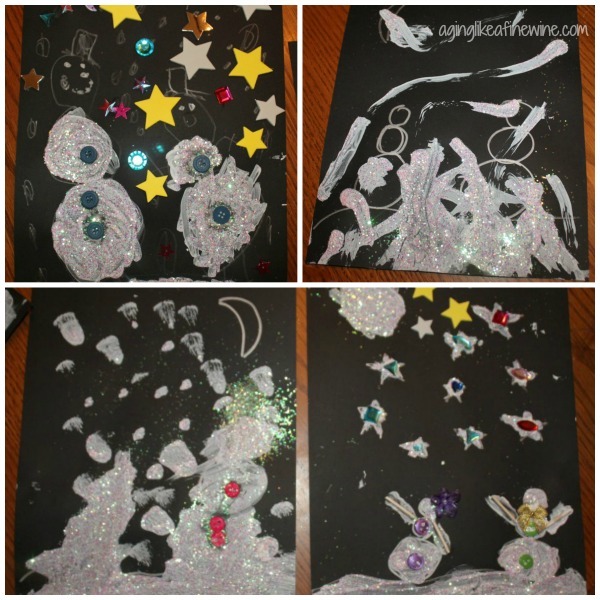 Put little dots of glue all around the cardstock and sprinkle on white glitter for snow. My grandchildren’s version of the snowman at night! Whether you do just one of these or all three, the most important thing is to have fun together. 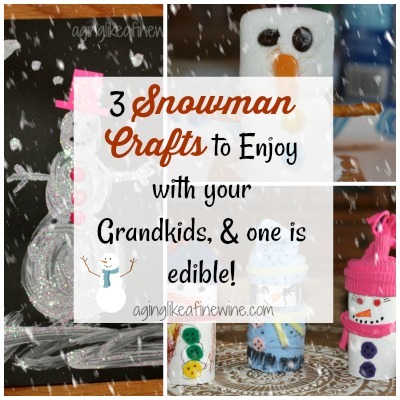 Allow your grandchildren to be creative with their snowmen. Most of our crafts turn out much different than I had envisioned! 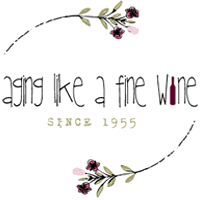 This post will be shared with the link parties found on my Where I Party page. How fun! I especially love the night time snowmen. That one is extremely easy and very customizable! Thank you for stopping by Beverly. Such cute ideas! I especially love the first one. Thank you Amy! That one is my favorite too! In fact, they are so darn cute, they are still sitting in the center of my kitchen table.